The burning issue of youth unemployment across the world has been debated at length. Over the past decade, unemployment amongst the youth has continued to rise. Statistics show that Africa has the world’s youngest population, with more than three fifths of its population under the age of 25 and the numbers expected to increase significantly. With majority of the working age population in Africa being so youthful, this has raised concerns over their inexperience and work ethic which often results in them struggling to find sustainable employment. A large number of students in Africa have matriculated and/or graduated with qualifications which are usually unable to meet the job market requirements. This gives rise to situations in which the youth find themselves without a job or earning a salary that fails to support either their needs or those of their families. The correlation between youth unemployment and economic performance should not be underestimated. Having established that more than two-thirds of the African population consists of individuals under the age of 25, the high unemployment rates indicate that the continent is yet to fully leverage the innovative and tenacious energy of the youth to drive economic growth. dreams and aspirations, which often leads to numerous social ills including criminality and substance abuse. are unable to provide, these unemployed youth may resort to heinous criminal acts in order to improve their financial situation. It is time that African governments and the private sector start addressing youth unemployment as the “business of youth unemployment”. Viewing the unemployment problem as a business has the ability to change the mindset of those attempting to tackle it. This alternative view of the problem will promote fruitful conversations with all stakeholders involved; especially the youth that unemployment directly affects. 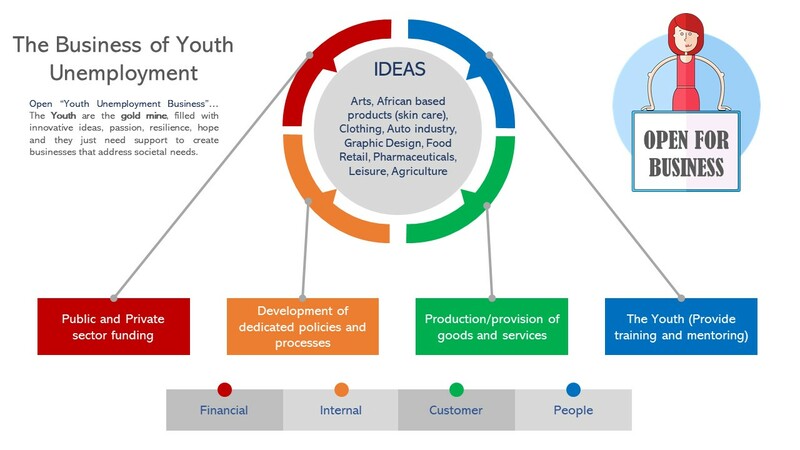 The “business of youth unemployment”, should encourage governments and the private sector in collaboration with the youth to develop suitable initiatives that will capacitate this business to achieve its strategic objectives of reducing unemployment, promoting entrepreneurship and developing the young workforce of the continent to realise their full potential as contributing members of society. Policy makers should focus their effort to developing policies that are informed/supported by continuous research that pulls together the key skills that the African Youth currently have and identify how they can be effectively coached to enhance their competencies. This will allow governments to steer the business in the direction of success, ultimately establishing sustainable youth owned businesses that provide targeted value to African economies and global consumers. At the core of policy development should be a consideration for the different walks of life, social backgrounds, communities, talents and abilities of the youth who the policies are meant to assist. Underpinning the foundation of this “business of youth unemployment” is getting the right stakeholders with the expertise to provide young people with the necessary guidance and tools to develop themselves. It should be noted that the success of these businesses is unlikely without the involvement of youth. Involving the youth in these discussions does not mean having them sit and listen to decisions that have already been made by officials who can only speculate what their underlying problems are as well as their possible solutions. Involvement means allowing youth to lead conversations on what their interests are, what they are developing and innovating, what they are writing and talking about, and what they possibly think could be the solution to operating businesses and companies that are sustainable. All this sounds easier said than done without having to focus on the bigger gorilla in the room which is lack of implementation by our leaders – both public and private. Setswana sa re ‘botlhale jwa phala bo tswa phalaneng’ – literal translation of this proverb is ‘the wisdom of the impala comes from the young impala’. Our parents and leaders in this country should take heed and act accordingly. It is no longer acceptable for the leadership in the public and private sectors to sit idly by and lament about the job creation problem without moving swiftly towards a solution. We know the problem (unemployment), now let’s focus on finding a sustainable solution that will contribute immensely to the economic growth agenda of our blessed country.